While basic, the GX49 speeds up everyday DAW tasks and won't break the bank either. Very reasonably priced but well built too. Easy to use. Apart from the buttons there's only one real-time assignable dial. One of our biggest gripes with controllers are those that promise straightforward DAW integration and don't deliver! So can the GX49 live up to its promise? The USB 'class compliant' GX49 looks sleek in its black plastic shell. Everything feels solid and the pitch bend wheel has a nice/precise tension that allows very accurate bending! All the major controls are found on the left, including a dial which defaults to MIDI volume, octave and transpose buttons that are backlit (and which change colour to denote the octave selected) and seven further MIDI-assignable rubberised backlit buttons. There's also a secondary level available via the Shift button, giving you 14 buttons (total) for MIDI-assigning duties. We would have no hesitation using the GX49 to play detailed piano parts or synth leads/chords/basses. Above the buttons are the default DAW assignments which include cycle, stop, play, record, click on/off and advance bar forward/ back (hold for fast forward/back) - so all the basic functions you use regularly. Press Shift to access the secondary DAW functions including track up/down, patch up/down, and three switch modes (these default to mixer, instrument and smart controls when using Logic X). 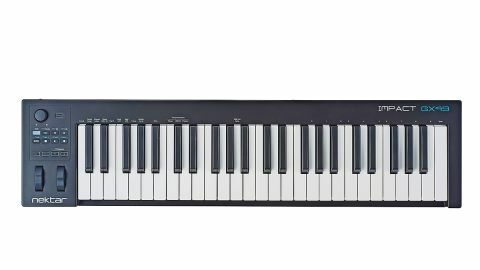 The keyboard has a nicely deep key travel and the well-balanced springy feel facilitates fast accurate playing, both for synth lines and sounds that normally demand a weighted action (such as pianos); it straddles both of these remits well and we would have no hesitation using the GX49 to play detailed piano parts or synth leads/chords/basses. Written above the keyboard you'll also notice functions accessed via the Setup button and these functions allow custom MIDI set-ups/assignments to be made/ stored if you don't want to use the included DAW templates (your custom settings are stored on power cycle). It's a shame that you can't store more than one custom set-up onboard, but it's all very intuitive. DAW integration-wise, this is the first controller we've reviewed that actually does everything it promises! We registered on the Nektar site, downloaded the Apple integration template for Logic/GarageBand, restarted Logic and that was it! As a simple no-nonsense controller, the Impact GX49 does the job effortlessly/reliably with just enough features onboard for speeding up everyday tasks. The USB power via an iPad/camera connection kit and class compliant USB driver are real bonuses too. Those wanting more real-time controls/pads/sliders should look at the more fully-featured LX/Panorama ranges but if you need a cheap, well-built, simple to use controller that feels great and has solid basic functionality, then look no further!